What Doesn’t Kill You [blah blah] Stronger is a gloriously funny whirlwind of a cabaret, paying tribute to those who have suffered notable near-death experiences – such as Alexander Selkirk (who was marooned on an island of feral cats), Anne Hodges (the only known person to be hit by a meteorite), and Violet Jessup (the unfortunate stewardess who survived three shipwrecks). Although most of these stories will sound familiar to anyone with a passing interest in weird historical anecdotes, the aggressively charismatic Erin Hutchinson and Tyler Jacob Jones transform these tales into a diverse assortment of hilarious musical numbers. Joined by Joshua Haines on piano, who plays an original score by composer Robert Woods, this cast of three exceptionally skilled local performers is an absolute delight to watch on stage. Their ceaseless enthusiasm, faultless musical capabilities and charmingly weird jokes ensure that the show remains captivating from beginning to end. 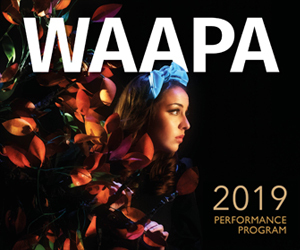 Special mention goes to Jones’s two-hatted “trio” musical number – and where else can you hear WA performers use their classically trained voices to sing about faeces over a calypso beat? What Doesn’t Kill You… was last seen at the 2018 Fringe World, where it won both the Martin Sims Award for the best new Western Australian work, and the The West Australian Arts Editor Award. It’s easy to see why. What Does Kill You [blah blah] stronger plays Downstairs at the Maj until February 9. Pictured top are Tyler Jacob Jones and Erin Hutchinson. Photo: Pia Fruin.